There were 709,617 half eagles minted in Carson City, from 1870-1884, and 1890-1893. The scarcest and most desirable half eagle is the first-year-issue 1870. Several other dates that present challenges to collectors, include the 1872, 1873, 1876, and 1878. Eighteen Ninety-One (1891) is the most common date in the half eagle series and accounts for over one third of the surviving population in this series from the Carson Mint. In higher Mint State grades (MS-64 and above), even this date is considered rare. Rusty Goe, the author of The Mint on Carson Street, estimates that no more than 1.35% of the Carson Mint’s original mintage of half eagles survives today. This suggests that no more than 9,600 (probably less) “CC” half eagles, spanning 19 different dates, are available to collectors. And remember, the 1891-CC constitutes more than a third of this total. The Carson City Mint produced 299,778 gold eagles over the same 19-year span that covered half eagles: 1870-1884, 1890-1893. The eagle series is by far the rarest of the three “CC” gold denominations. Several years of production saw anemically low mintage totals, including 1870’s 5,908 pieces, 1872’s 5,500 pieces (some sources report 4,600), 1873’s 4,543 pieces, 1876’s 4,696 pieces, 1877’s 3,332 pieces, 1878’s 3,244 pieces, and 1879’s stunted output of 1,762 pieces. Just like in the half eagle series, 1891 saw the highest production of gold eagles at the Carson City Mint, with its 103,732 coins. Again, according to Rusty Goe, survival totals are small for "CC" gold eagles. He estimates that no more than 3.22% of the original mintage total survives today, with the percentage probably under the 3.2% mark. This translates into a surviving population of no more than 9,655 pieces spanning 19 dates in the eagle series, with the actual total probably less. The 1891-CC date, according to Goe, accounts for as much as 46% of the entire population of “CC” gold eagles, which reveals just how rare most of the other dates are in this series. Mintage totals show that the Carson Mint produced 864,179 double eagles in 19 different years, making this the most abundant gold denomination from that institution, both in quantity and face value. Production years for "CC" double eagles ran from 1870 through 1879 and from 1882 to 1893 (no coins minted in 1886, 1887, and 1888). The first-year-issue, 1870, saw the lowest output, with a mere 3,789-piece total. Twenty-one years later, in 1891, The Carson Mint delivered the second lowest quantity of double eagles, with just 5,000 pieces issued. The years 1874 through 1876, peak years on the Comstock Lode, saw the highest double eagle production at the Carson City Mint, with 1876 topping out at 138,441 pieces. 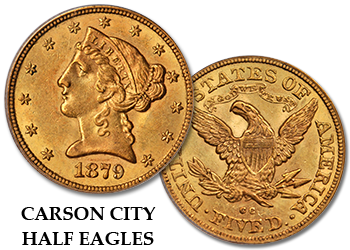 Every Carson City gold coin collector dreams of owning an 1870-CC double eagle, crowned the “Queen of Carson City gold coins.” Rusty Goe estimates that between 55 and 65 1870-CC double eagles survive today. Goe also estimates that no more than 3.18% of the original mintage of “CC” double eagles is extant, which means at most 27,455 “CC” double eagles, spanning 19 dates, are available to collectors. Goe suggests that this number is probably on the high side and believes the true total is probably 2,000 to 3,000 less. Besides the 1870-CC, which is in a rarity class by itself, seven other dates in the “CC” double eagle series stand out key issues: 1871, 1872, 1873, 1878, 1879, 1885, and 1891.